A wonderfully authentic Thai restaurant run by Nigel and his Thai wife – hence the wonderful dishes! For an intimate dining experience that blends a taste of Italy with coastal cuisine, Papa Nino’s is well worth a visit. It’s a lively little restaurant and tends to be popular, so booking is highly recommended. It is an old school Italian in the best sense of the word with a traditional range of dishes. Worth a note, they only accept cash. Built in 1420 and situated in the heart of East Looe among the famous backstreets but only 100yds from the seafront, the Smugglers has been serving quality food for over 50 years with a legendary 600 year old History. The Restaurant specialises in Local seafood and prime seaks along with its now famous Carvery. 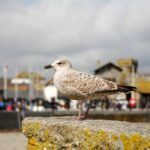 The restaurant is in one of the oldest buildings in Looe, still largely preserved in its original form, the cellar and loft are known to date back at least 450 years. Reputed to be a former haunt for smugglers and sea faring men of the 16th Century, it was then known locally as “The Run” probably due to it’s time honoured association with smuggling which was rife along the Cornish coast. 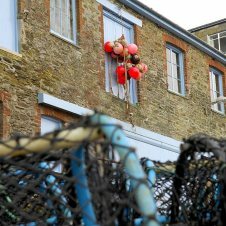 The Old Sail Loft is one of the top Restaurants in Looe. Open Evenings and for lunches they specialise in steaks and fresh local fish straight from the boats. Offering a`la carte and bistro. 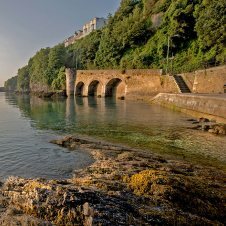 The restaurant is on the quay side overlooking the harbour, just see the menu. As February 14th looms are you still looking for that extra special restaurant to spoil that extra special person in your life? Looe really is spoilt for choice when deciding on an eaterie. We have many award-winning restaurants serving top notch food, most of which is sourced or caught locally. Why not check out some of our personal favourites! Blowing away the cobwebs! 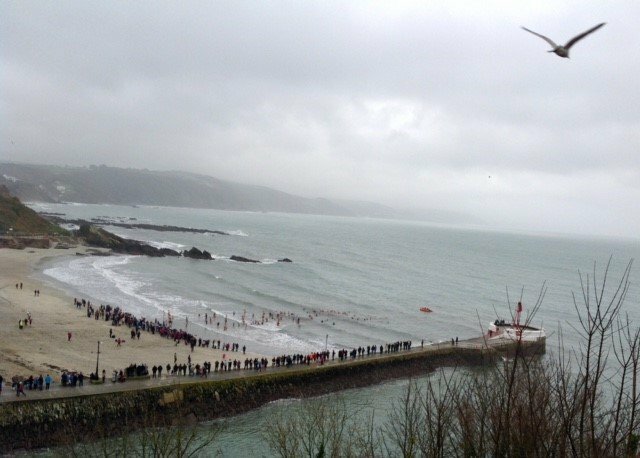 As the tradition continues, Looe locals and visitors alike took to the sea on New Year’s Day to take part in the charity New Year’s Day swim. Monies raised went in aid of the RNLI and swimmers were rewarded with hot drinks and a warm welcome in the RNLI HQ on the Quay. Why not try it yourself this year?